Thank you to Ruth Ayres at Ruth Ayres Writes. 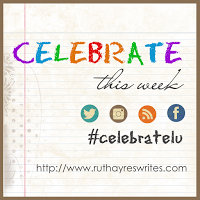 She hosts a link-up every week that focuses on the reasons we have to celebrate. This is my reason to celebrate, but you can visit her website to read about other bloggers' celebrations. One of my favorite professional conferences to attend is the annual conference of the International Literacy Association. I attended this year's conference, which took place in Orlando, Florida, last weekend. While there I reflected on my first experience at ILA, which was also held in Orlando and, I believe, in 2011. Although much of the experience was the same, my days were filled with valuable learning provided by engaging speakers with a passion for literacy just as much then as now, something was different. Much has changed with technology, social media, and educator's abilities to stretch their professional learning networks beyond school walls and across the globe. This has made a difference in how I experience an in-person conference such as ILA. I've used social media in the past few years to expand my own professional learning network and to learn professionally from others in different parts of the country. My experience at ILA this year was enhanced, as it wasn't before these possibilities existed, because I could connect with educators that I interact with on social media in person. Kerry, is a member of the Facebook group, Literacy Teacher Book Club, that I started to discuss professional texts with other educators. Lena Marie facilitates the Read4Fun group that I participate in through Twitter and Voxer. Lorraine is a member of the #bookexcursion group that I formed with other teachers and librarians to read and share children's literature. I was lucky to meet each of these educators at the conference in person. In person, we continued the conversations we have through social media about literacy teaching and books and began new conversations based on our shared experiences at ILA. This week I celebrate these educators and all social media friends who haved help to grow my knowledge of literacy and teaching. Lisa, it was just last year at ILA that I met you and our connection has strengthened since then. I am glad that you met up with Lena. I also met her at ILA last summer when she came to my EdCampLiteracy presentation. We continued to meet up during the weekend. Unfortunately, this summer I did not attend the event but followed along on Twitter. My new grandbaby is my focus this summer. Have a great week and thanks for sharing your great experience and meetups. I was so glad to have met you last summer! It was a treat to meet Lena, as well, this year. It's funny because we both live in Massachusetts, but met in person in Florida! I wouldn't want to tear myself away from that grandbaby either! This sounds exciting. Experiencing the conference together with friends amplifies the joy. I loved attending every conference I could, love hearing that you do, too, Lisa! And continuing with friends online is also fun & more learning! I love conferences, too - it's wonderful to connect face to face, isn't it? I agree with you that connecting with our online friends at conferences is a true highlight. I loved meeting blogging buddies at NCTE and Al Write conferences. We are fortunate to have many ways to grow our PLN in this age. I love the face to face time with friends from social media. You've given me some new groups to explore and I'm glad to read you are actively involved with others. We need the support on our teaching journeys. It's Monday! What Are Your Reading?